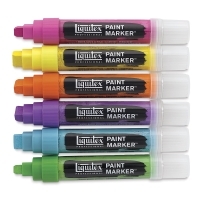 Liquitex Professional Paint Markers are professional-quality waterbased acrylic markers for artists. 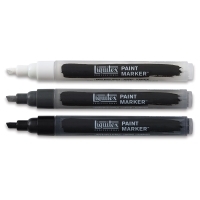 Formulated using artist-grade pigments, these outstanding markers are permanent and lightfast. 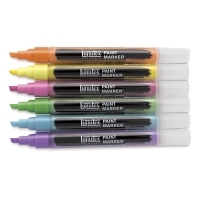 Available in a wide selection of brilliant colors — including iridescent, fluorescent, and transparent colors — the markers feature precision nibs in two sizes, for ultimate control. All of the colors in the range match the Liquitex color spectrum and are compatible with other Liquitex products, including Heavy Body Acrylics, Soft Body Acrylics, Professional Spray Paints, Mediums, and Varnishes. 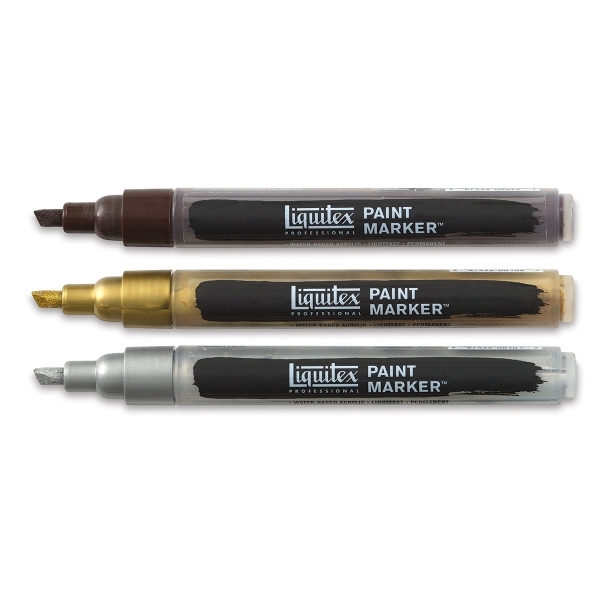 Suitable for both indoor and outdoor use, Liquitex Professional Paint Markers can be used on a wide range of surfaces, including primed canvas, wood, masonry, metal, and glass. They are lightfast-rated ASTM I or II (except for the fluorescent colors). Fluorescent, Sets of 6 — These sets include one each of Fluorescent Green, Fluorescent Blue, Fluorescent Red, Fluorescent Pink, Fluorescent Orange, and Fluorescent Yellow. Primary Colors, Set of 6, Wide Tip — This set includes six markers with a 15 mm nib, including one each of Titanium White, Carbon Black, Cadmium Red Medium Hue, Cadmium Yellow Medium Hue, Emerald Green, and Brilliant Blue. Primary Colors, Set of 6, Fine Tip — This set includes six markers with a 2 mm nib, including one each of Titanium White, Carbon Black, Cadmium Red Medium Hue, Cadmium Yellow Medium Hue, Emerald Green, and Brilliant Blue. Vibrant Colors, Set of 6 — These sets include one each of Cadmium Yellow Light Hue, Cadmium Orange Hue, Medium Magenta, Brilliant Purple, Light Blue Permanent, and Vivid Lime Green. 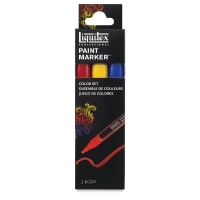 Primary Colors, Fine Tip, Set of 3 — This set includes three markers with a 2 mm tip, including one each of Cadmium Red Medium Hue, Cadmium Yellow Medium Hue, and Cobalt Blue. Essential Colors, Fine Tip, Set of 3 — This set includes three markers with a 2 mm tip, including one each of Carbon Black, Titanium White, and Neutral Gray 5. Iridescent Colors, Fine Tip, Set of 3 — This set includes three markers with a 2 mm tip, including one each of Iridescent Rich Silver, Iridescent Antique Gold, and Burnt Umber.